Simplex Strainer, Size 4", Connection Threaded, Screen Size 1/8", Max. Pressure (PSI) 150, Blow-off Port (NPT) 1/2", Material of Construction PVC, Width (In.) 17-17/64, Height (In.) 22-19/64, Screen PVC, Seal EPDMItem: Simplex StrainerSize: 4"Connection: ThreadedScreen Size: 1/8"Max. Pressure (PSI): 150Blow-off Port (NPT): 1/2"Material of Construction: PVCWidth (In. ): 17-17/64Height (In. ): 22-19/64Screen: PVCSeal: EPDMThis product can expose you to chemicals including Styrene, which is known to the State of California to cause cancer and birth defects or other reproductive harm. 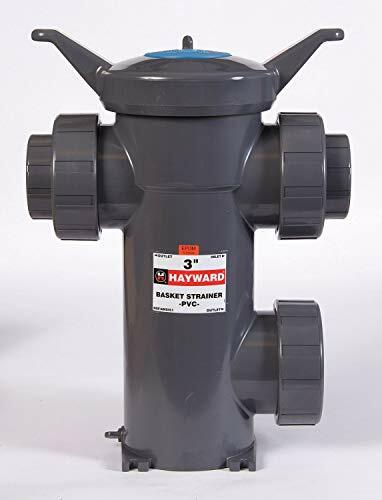 Simplex Strainer, Size 2-1/2", Connection Socket, Screen Size 1/8", Max. Pressure (PSI) 150, Blow-off Port (NPT) 1/2", Material of Construction PVC, Width (In.) 16-33/64, Height (In.) 22-19/64, Screen PVC, Seal EPDMItem: Simplex StrainerSize: 2-1/2"Connection: SocketScreen Size: 1/8"Max. Pressure (PSI): 150Blow-off Port (NPT): 1/2"Material of Construction: PVCWidth (In. ): 16-33/64Height (In. ): 22-19/64Screen: PVCSeal: EPDMThis product can expose you to chemicals including Styrene, which is known to the State of California to cause cancer and birth defects or other reproductive harm. Simplex Strainer, Size 2", Connection Socket/Threaded, Screen Size 1/8", Max. Pressure (PSI) 150, Blow-off Port (NPT) 1/2", Material of Construction PVC, Width (In.) 12-3/4, Height (In.) 15-1/2, Screen PVC, Seal EPDMItem: Simplex StrainerSize: 2"Connection: Socket/ThreadedScreen Size: 1/8"Max. Pressure (PSI): 150Blow-off Port (NPT): 1/2"Material of Construction: PVCWidth (In. ): 12-3/4Height (In. ): 15-1/2Screen: PVCSeal: EPDMThis product can expose you to chemicals including Styrene, which is known to the State of California to cause cancer and birth defects or other reproductive harm.